Wahebe Darge scored his first Phantoms goal at Swindon last night. Peterborough Phantoms paid the price for two sloppy starts when succumbing to the hottest team in the English Premier League last night (October 8). That was the view of coach Slava Koulikov following a 5-3 defeat at a Swindon side winning a fifth successive game. Martin Susters scored the first Phantoms goal at Swindon. 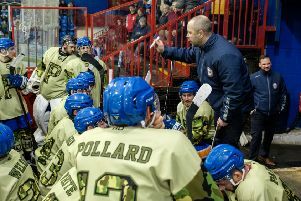 He saw his team wipe out an early-two goal deficit to hit the front before the end of the second session, only to then be brushed aside in the final period at the Link Centre. Phantoms made the worst possible start when falling behind to a Jonas Hoog strike after just 10 seconds and a powerplay effort from Tomasz Malansinski meant the deficit soon doubled. But the city men battled back from their early setbacks to transform the game by the end of the second period. They clawed their way level of a pair of powerplay goals – a welcome development given Phantoms’ special teams have failed to fire in the opening weeks of the season. Owen Griffiths scored his first Phantoms goal against his old club Swindon. Martins Susters halved the arrears when poking the puck home from close range after a Darius Pliskauskas shot had been saved by Swindon netminder Stevie Lyle. And they equalised earned in the middle session thanks to a landmark strike from new import ace Wehebe Darge. The Australian international grabbed his first goal in EPL hockey after Tom Norton and Marc Levers had worked an opening during another numerical advantage. And the transformation was completed in the penultimate minute of the period when Owen Griffiths struck his first Phantoms goal with a back-hander against the club he represented last season. But that was as good as it got for Koulikov’s men as hosts Swindon responded with a triple-whammy during a dominant third-period display. They restored parity 65 seconds in courtesy of Wildcats player-coach Aaron Nell and soon hit the front again as Jan Kostal bundled in. And the game was put beyond the reach of Phantoms when Sam Bullas tapped the puck past netminder Adam Long, who again deputised for the injured Janis Auzins, from close range with just over eight minutes to go. Koulikov said: “We paid the price for starting two of the three periods very poorly. “Conceding after 10 seconds of the first and 65 seconds of the third was very disappointing. “On both occasions we let in another goal a few minutes later, and it was those spells that ended up costing the chance of picking up a good result. “It is a shame because we played very well for big parts of the game against a Swindon team who are on a roll right now. “We did really well to come from 2-0 down to go ahead just before the end of the second period. “We stressed the need to start the third period strongly and try to hold our lead, but the whole dynamic of the game changed barely a minute in. Phantoms are back in action tonight (October 9) when they entertain Sheffield Steeldogs at Planet Ice (5.30pm). The sides sit seventh and eighth respectively in the EPL standings. Koulikov is sweating on the fitness of two forwards who were both forced out of the action at Swindon last night. Sam Towner took no further part after being on the receiving end of a blind hit in the opening period while Connor Glossop suffered an upper-body injury during the third session.